Finding large volume of saline water to support oil field developments in an arid region of the Barmer Basin, Rajasthan, India, was a challenge. Prior to this study, very limited information was available about aquifers deeper below 150 m below ground level (bgl). The present paper describes the characterization of a deep aquifer system using oil field data acquired during hydrocarbon exploration and development. 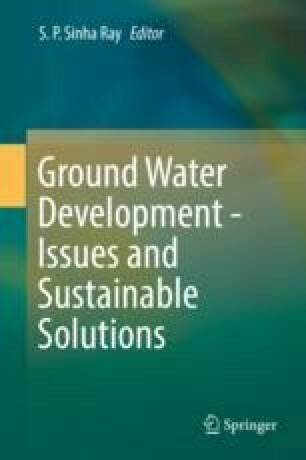 The objective of the study was aimed to identify saline water that has no practical use for domestic or irrigation purposes at economically viable cost without any adverse effect on freshwater system. Detailed regional hydrogeological study has been carried out using oil exploration data, i.e. seismic, geophysical logs, etc. followed by aquifer well drilling and testing to understand the hydrogeology of the southern part of the Barmer Basin. It has been found that extensive confined multiaquifer systems exist between 150 and 1000 mbgl. Aquifers were identified by using oil field well logs and cores of exploration and development wells. Four distinct groups of permeable granular zones separated by impermeable zones have been identified. The spatial extent of the aquifer has also been mapped with the help of seismic reflection data. Finally, geometry and thickness of the aquifer have been defined of each layer with reasonable accuracy. The salinity data of drilled wells indicate that groundwater salinity increases with depth. Brackish (2500 mg/L) groundwater occurs at the top and becomes highly saline (~17,500 mg/L) at the bottom. An extensive deep confined saline aquifer has been identified in Jagadia (Miocene) formation. Aquifer test has been conducted to understand the hydraulic characteristics and water quality of this aquifer. The results indicate that hydraulic conductivity is in range of 20–25 m/day in the Jagadia formation. Salinity of groundwater is ~17,500 mg/L. The aquifer is shallower in the north and gradually deepens southwards where aquifer top is ~1500 mbgl. The gross thickness of sand in the Jagadia formation varies from 25 m to a maximum of 600 m (south-east). The total gross calculated volume of the aquifer is ~2.6 × 109 m3. The aquifer contains unconsolidated to poorly consolidated, medium- to coarse-grained, moderate to well-sorted, subrounded sands. Quartzose with carbonaceous claystone and clay interbeds and minor lignite are also present. Grain size analyses indicate a mostly uniform formation with the majority of samples having a uniformity coefficient of 4 or less. The effective porosity has also been derived from petrophysical logs, and it is ~20% in the northeast and increases to ~30% in the southeastern boundary. This large static groundwater resource within the Jagadia formation below ~250 m depth has been identified as suitable aquifer for saline water abstraction to meet the long-term saline water requirement of oil fields in the southern area of the Barmer Basin. This aquifer is not in use for domestic and irrigation purposes due to salinity and its depth of occurrence. Saline water abstraction is not likely to deplete the limited dynamic shallow groundwater resources. The authors are thankful to Cairn oil & Gas, Vedanta Ltd for the technical support tendered for the present study.